Happy Fall, Y’all. I bet you thought this article would be about organic pumpkins, free-range turkeys, and football fun. 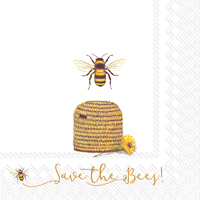 Well, I debated being that cliché but decided instead to provide you a break from the traditional green November themes and instead concentrate on a fun fall wedding theme. 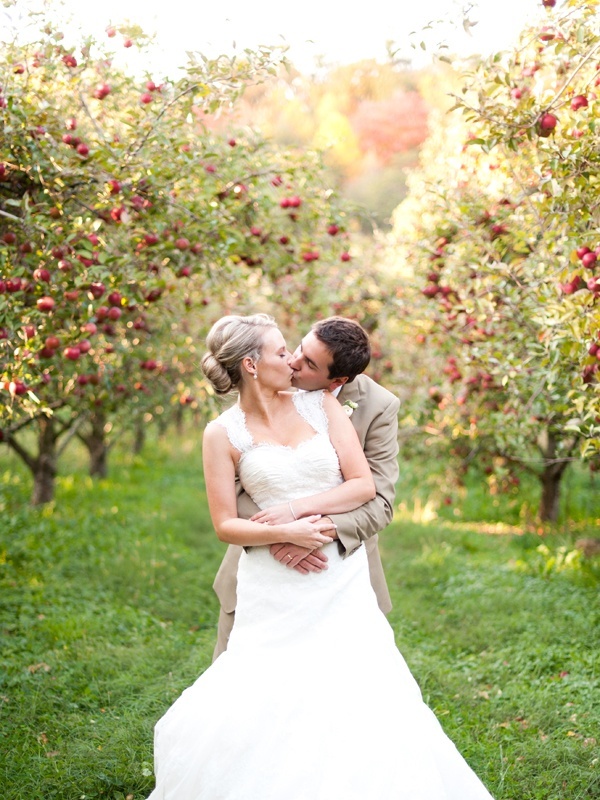 Apple harvest time is a wonderful activity to highlight in an eco-chic wedding. This theme brings up images of cool weather, snuggling under warm blankets, hot cider and comfort in every sense of the word. It’s appealing to all ages (insert groan at bad apple pun here). 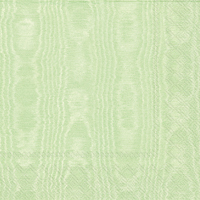 Whether you choose to focus on Granny Smith green or Red Delicious, there are multiple color palettes you can use. 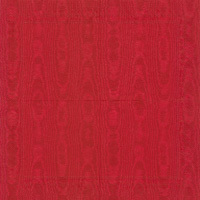 Red, green, gold, even a slightly pink-salmon color works. 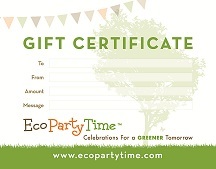 Use Ecopartytime’s new “shop by color” feature to check out their red and green colored plates, straws, napkins, silverware and cups. 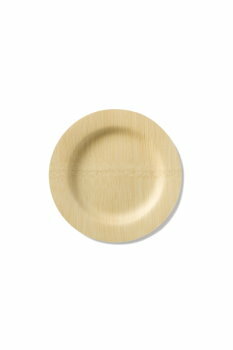 Their bamboo tableware can also lend a rustic wood element to your tables. If you are lucky enough to live near an orchard, you might even be able to hold your wedding and reception right in the middle of all the trees. Three really awesome effects of holding your wedding at an apple orchard is 1) you support a local business with your rental fee, 2) you introduce your guests to a local farmer they might not know and 3) your eco-chic décor only has a few feet to travel which saves a bunch of carbon emissions! Talk about “Farm Fresh”. 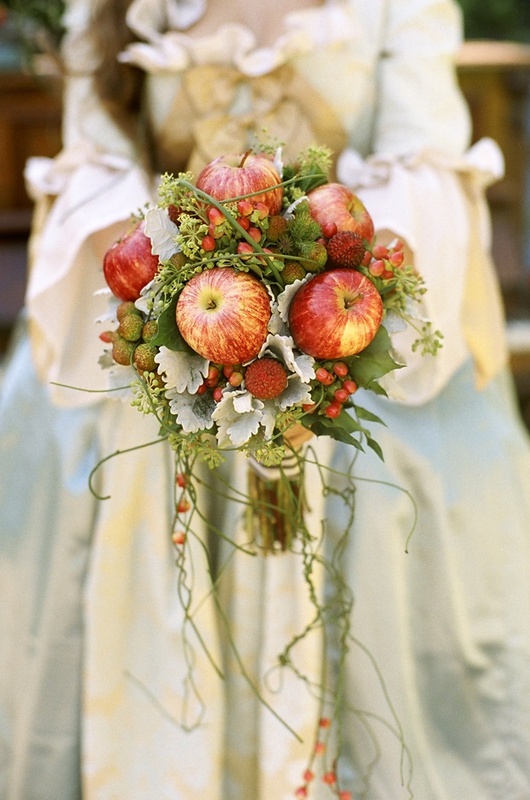 I love fruit incorporated into wedding bouquets and decor. Apples are such a unique addition to an otherwise basic bouquet. They can really elevate your flowers from “Ooh” to “Wow” in a heartbeat. 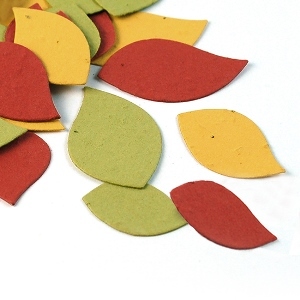 Adding apples to your event décor reduces the amount of money you have to spend on decorations exponentially. One apple will run you around 65 cents versus the 2-5 dollar price tag of a cut flower (dependent on season and type). In addition to the budget savings, whole uncut apples can be donated to local food shelters after your wedding, providing some fresh food to someone in need. You can’t have an apple themed wedding without some sweet apple cider. Whether you serve it cold or heated, a mouthful of this apple-y yumminess will make even the grumpiest guest smile and sigh in contentment. 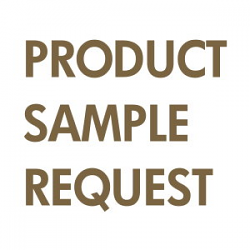 Instead of offering just one basic option, consider a “make your own cider” action station. 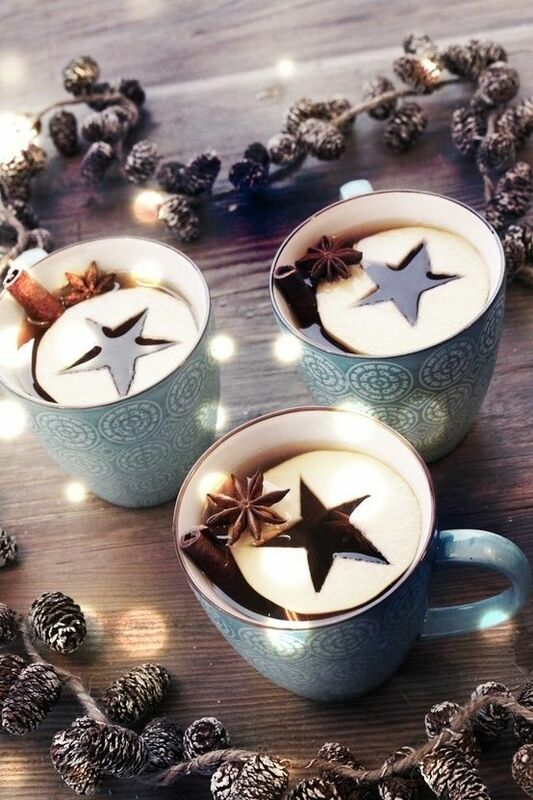 Start with hot & cold versions of basic & spiced cider, then offer extras for customization like paper straws for stirring, cinnamon sticks, anise pods, fresh ground nutmeg & cinnamon mini-marshmallow. Layer in adult-only options like cinnamon whiskey, vanilla vodka, champagne and Grand Marnier. 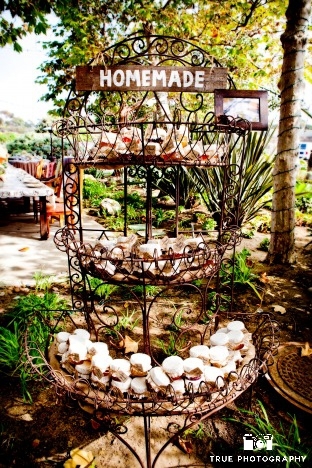 Another station that would make your guest’s jaws drop would be a fun apple-themed seating station like the amazingly eco-chic one Amy Smart & Carter Oosterhouse created for their green wedding. 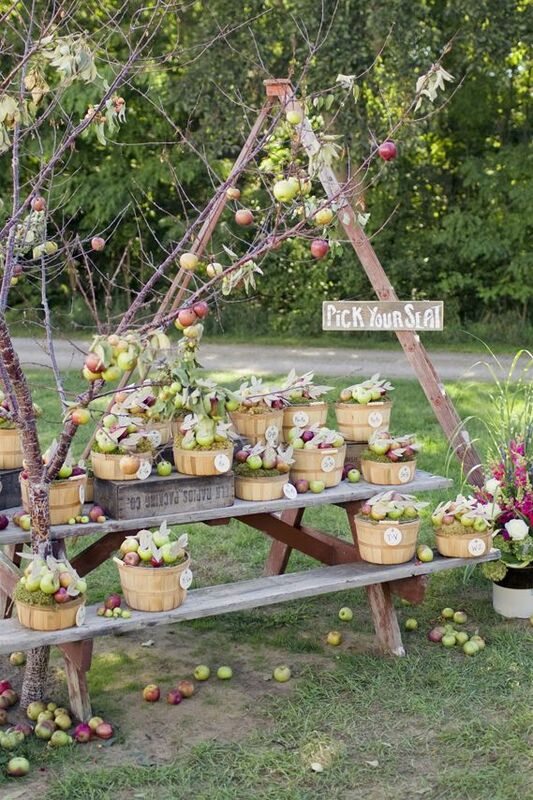 Simply place whole apples with seeded paper leaf nametags, in apple baskets on a ladder, vintage truck bed or picnic table & add a wooden sign saying “pick your seat”. You can’t have a wedding these days without a photobooth, it seems. For a wedding like this, I’d suggest ditching the cliché photobooth with a flat wall background and taking advantage of your surroundings. 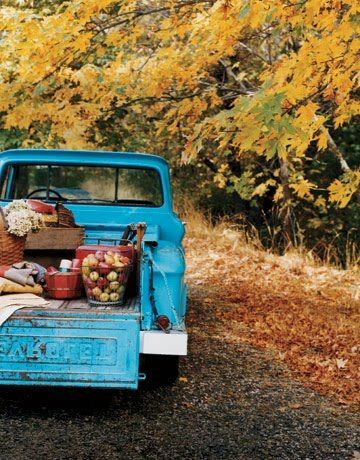 Park a vintage pickup truck under some trees with changing leaves and fill the bed with baskets of apples, blankets, picnic or tailgate essentials, etc. and allow guests the freedom to choose their pose. Either in the cab, or in the truck bed, they aren’t limited by an 8x8 piece of fabric. 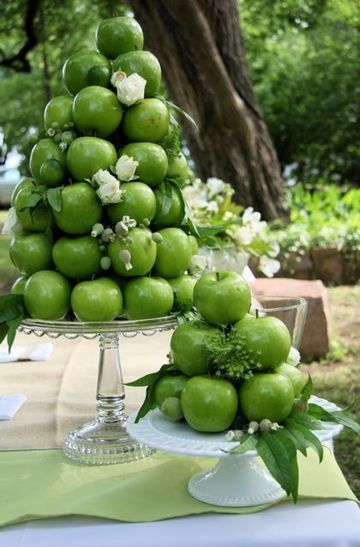 For your apple wedding favors, edible takeaways are a definite must! The possibilities are endless. Apple butter, mini apple pies, homemade apple cider all will disappear quickly. Please post pictures of your Brilliantly Green Apple Harvest Wedding with the hashtag #Ecopartytime so we can share in your sweet and sustainable big day! 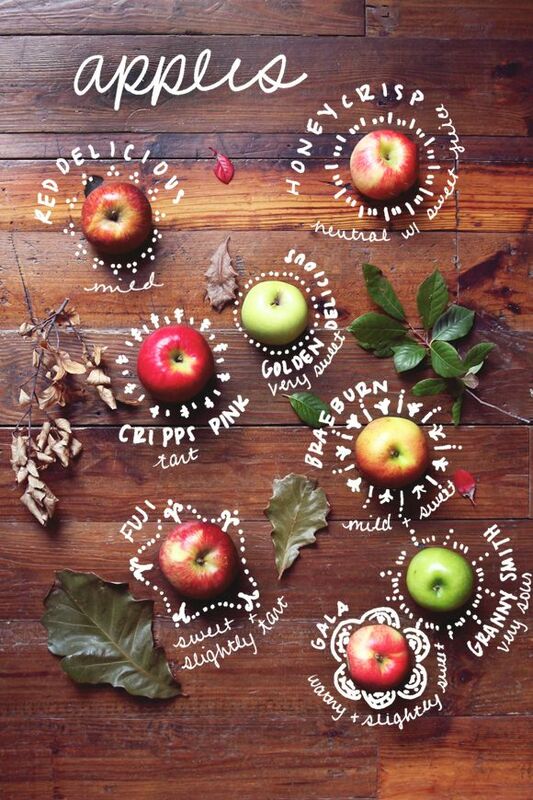 We’d love to see your design ideas for an awesome apple harvest happening! 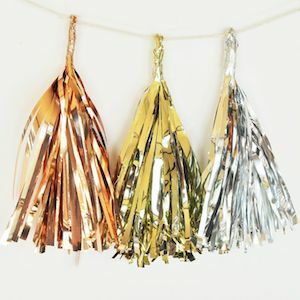 This is Melissa Wagner-Gens, Chief Chica Verde & your brilliantly green event expert wishing you “Love, Laughter & Happily Ever After”!